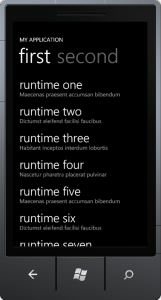 Just a short post today about how to compile Expressions under Windows Phone 7. Expression Trees are a powerful feature since .NET 3.0. They can be used to create executable code fragments dynamically at runtime and have a wide range of purposes, for example to implement the Specification Pattern and Guard Classes. After you’ve built up your expression tree (which is a tree representation of real code), you can execute your code fragment by calling expression.Compile().Invoke(). When it comes to Windows Phone 7, that’s a problem… because there is no Compile() method on the Expression class. Since the WP7 platform has limitations at some points (regarding dynamic coding, Reflection, etc. ), it doesn’t have a Compile() method at the moment (let’s hope the MS guys are fixing this in the near future…). This second blog post on WP7 development will be rather short, showing the characteristics, similarities and differences as well as usage scenarios of both the Pivot and Panorama control. Personally I like the look & feel of the Pivot and Panorama controls very much. Both give you a UI experience of „several pages“. You can change between those pages with a flick gesture or on the Pivot control by selecting the next page directly. It’s a cool UI and fits perfectly in many mobile usage scenarios. The Pivot control gives you the UI experience of a „tabbed view„, optimized for mobile devices. The pages (= „PivotItems“) are like single tabs. Not all tabs are rendered at once, instead a tab is rendered when a neighbor tab is activated. Thus it’s rendered when you select the tab and the user gets a smooth UI experience. You can change between the tabs with a flick gesture or by clicking the title of the tab. You can define a background image for the Pivot control as a static image that doesn’t change or move when you switch between tabs. Usage scenarios of the Pivot Control consist in pages of independent data as well as several tabs as stages of hierarchical data or special filtered views of the same data set. The Pivot control is perfect to show categorized lists of data and to dig into the details of data. It doesn’t need this wide open space like the Panorama control. The Panorama control gives a user the experience of a continuous view over several pages (= „PanoramaItems“). On the right border of a page you see the continuation to the next page and you can flick between pages back and forth. Unlike the Pivot control, all Panorama items are rendered initially when the Panorama control is loaded. You can define a Panorama background image on the control that moves while you switch between the pages (as well as the application title). This gives a nice and appealing effect to users. Usage scenarios of the Panorama control include overview pages like startscreens of your application. It’s like a showroom for your application, which is attracting users to your app. Panorama items are perfect entry points for applications, which summarize or aggregate application features and/or data and simplify navigation through the application. It’s not so good to create dense lists or to show details of data, what should be the domain of the Pivot control. Instead the Panorama control should have space to breath to give the best experience to users and should show just the important information at a central starting point. Furthermore you should not integrate an application bar into a Panorama view (use the Pivot instead). That’s it for today. I hope I could show you some commonalities and differences of both the Pivot and the Panorama control. Both are great controls with a compelling user experience, but slightly different usage scenarios. The key rule should be: Panorama for the coarse, Pivot for the detail. I’m currently engaged in the development of a more or less complex data-driven WP7 application, which utilizes many features of the WP7 development platform. In a series of upcoming blog posts I want to share my experiences and tips&tricks with you. In this blog post I will show you how to get started with the WP7 development: tools you need, VS2010 project templates you get and how to set up images and icons for your application. The great news for .NET developers are: The main development platform for WP7 is Silverlight! Not the current Silverlight 4, but a modified version of Silverlight 3, which is enhanced with support for the camera, the phone sensors and with phone controls like the Panorama and the Pivot control. My experiences so far are that there are some shortcomings, you cannot use every feature of Silverlight 3 and you have to learn the principles and characteristics of the WP7 platform (like Tombstoning, controls, Application Bar, UI design, …). But in the whole if you are a Silverlight developer then the learning curve is not very steep and it’s seamless like with no other platform to develop WP7 apps. It’s a great experience and you’re very fast in implementing your ideas in compelling apps. Visual Studio 2010: WP7 development is seamlessly integrated into the VS2010 IDE with all the development comfort (debugging, deploying, designer, Intellisense, …) you’re already comfortable with. Windows Phone 7 Developer Tools (DL, +Jan11 Update, +Fix): Those tools give you a Windows Phone emulator and integration into VS2010. Silverlight for Windows Phone Toolkit (DL): With the Toolkit you get dozens of new and modified components which you can use in your WP7 apps. Expression Blend 4: Especially in WP7 apps you have to bother with a nice UI design and Blend is the tool of choice to do that. It’s a very feature-rich design tool and yes: you need some time to incorporate with it. But the features and the outcome are more than worth it! 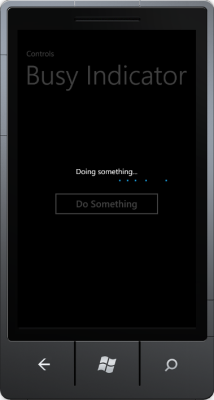 Windows Phone Application: A blank WP7 application. Windows Phone Databound Application: A WP7 application with some bound sample data (using the MVVM pattern). 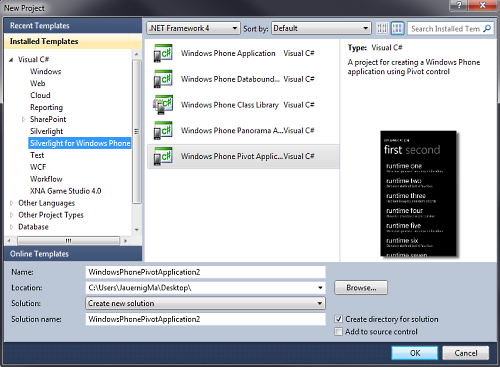 Windows Phone Class Library: This gives you a class library by which you’re able to structure your WP7 solution. Remember that the WP7 development platform is not .NET and not „default“ Silverlight 3, thus this new type of class library is needed. You’re able to add „normal“ Silverlight projects to your WP7 solution as well, but this will only work if you don’t use Silverlight features that exceed the capabilities of the WP7 platform. Windows Phone Panorama Application: Creates a project which uses the Panorama control to display bound sample data (using the MVVM pattern). Windows Phone Pivot Application: Creates a project which uses the Pivot control to display bound sample data (using the MVVM pattern). For Panorama and Pivot Applications there is another blog post coming, which covers the characteristics and use cases of both controls. 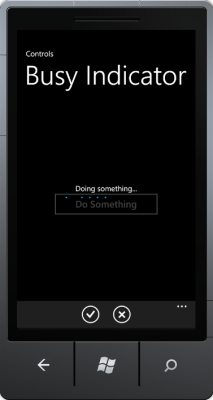 Let’s create a blank WP7 project, for example a „Windows Phone Pivot Application“. On the properties pane of your WP7 project you get several configuration options, i.e. you can define the name of your application that is shown in the app list or tile on your WP7 device and the icon for your application in the app list or tile. Those settings are stored in the „Properties/WMAppManifest.xml“ file, which you can edit manually as well and which is needed when deploying your WP7 app. 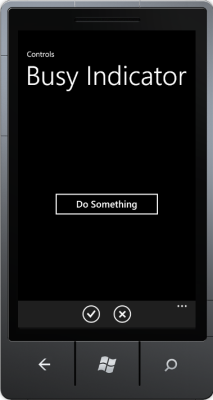 Background: Shows an icon for you application in the app list of your WP7 device. Image type has to be PNG. Must reside in the root folder. Build type must be „Content“. Background: Represents you app as a live tile on the homescreen. Background: Shows a splash screen while your app is loading. Image type has to be JPG. Definition: Name may not be changed, image is taken automatically when it exists. Background: Defines the Background image of the Panorama control. Definition: Use the Panorama.Background property. Background: Defines the Background image of the Pivot control. Definition: Use the Pivot.Background property. As you can see above in the „Requirements„, you don’t have every degree of freedom how to create and where to place your images/icons. This was frustrating to me, because I like to place such things in a separate subfolder of my project. Instead, they have to reside in the root folder, which I don’t like very much. That’s it for the moment. 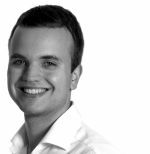 As said, just some introductory information to get started with WP7 development. Veröffentlicht am 2011/03/06 2011/02/27 Kategorien Windows PhoneTags Controls, Panorama, Pivot, Windows Phone 7, WP7, WP7Dev1 Kommentar zu WP7 #1: Getting Started! Finally, after some months of creative freedom I’m coming back to blog something. Currently my topic of choice is Windows Phone 7 (WP7) and I want to write some posts about my experiences with the phone and especially with the platform in the following weeks and months. I’m interested in WP7 personally and by profession, since my company SDX is investing in this platform and the „several screens and the cloud“ vision of Microsoft (I’m explicitly not saying „3 screens“, because it doesn’t make sense to give it a certain number). 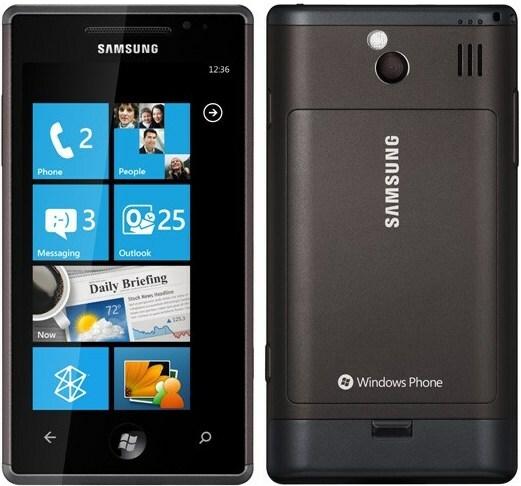 In this blog post I want to write about my experiences with the Samsung Omnia 7 just to get started with my WP7 blog series. I got the Omnia 7 some weeks ago and use it continuously. To get to the heart of my experiences: I love the Omnia 7! With the Omnia 7 it’s like with every new toy you get: in the first days you play around with everything. Thus after unpacking the device I begun with the initialization/configuration of my new Windows Phone 7. Adding my accounts was intuitive and very easy, integration with all my e-mail accounts, Windows Live and Facebook is seamless. Configuration is very simple at all. It gives you not much flexibility, but on the other side it feels very natural and you don’t have to pore over thick manuals to get everything to work. I started using the Omnia 7 extensively and I must admit: I love the UI! The overall „Metro UI“ design is clean, very clear and user-focussed. It has nothing to do with the awkward Windows Mobile UI, it’s just fresh and beautiful. The level of animations is just right to guide the user and to give him a nice experience. The concept of live tiles and hubs on the homescreen is very convincing, it’s user-centric instead of app-centric. It’s how a consumer phone UI should look and it’s really compelling to me. There are just some downsides on the UI. I would love an E-Mail hub and I don’t like the „app list“ very much. Of course you can pin important apps as tiles to the homescreen, but I’m not a fan of a long tile tube. One solution could be the definition of custom „hubs“, where you can integrate a bunch of apps and to which you have instant access by this way. For me this would be a real improvement! I compared the Samsung Omnia 7 with other WP7 devices of my colleagues: HTC 7 Mozart and HTC HD7. And in my opinion the Omnia 7 beats both devices clearly. It has a better speed when starting and using applications, giving a smoother UI experience at all. The AMOLED display is fantastic! Great colors, clear fonts, fantastic brightness and contrast. Clearly superior over the HTC devices. The form factor is good for me, it feels very comfortable in my hand. Battery life is really good, thus in my opinion it’s a a great piece of hardware! When it comes to the iPhone I think the Omnia 7 is nearly meeting on eye level, with the iPhone as matured winner. The iPhone 4 is superior in its exclusivity, its manufacturing and I love the Retina display! It has the great AppStore with fantastic apps. The Omnia 7 respectively Windows Phone 7 can’t compete with that! Of course, the WP7 marketplace is growing rapidly, but it’s still missing a mass of really great apps and games. In comparison to Apple’s AppStore apps or games are more expensive, partially terrifying! For example, the game „Assassin’s Creed“ is priced 0.99$ in the AppStore, while you have to pay 6.99$ on the WP7 Marketplace – wtf? This is really a wrong signal for me, but I believe that prices will drop when Marketplace competition increases. When it comes to the UI, both systems are doing very well. While the iPhone has a feature-rich UI, Windows Phone 7 shines with its user-centric interface and with its simplicity and usability. 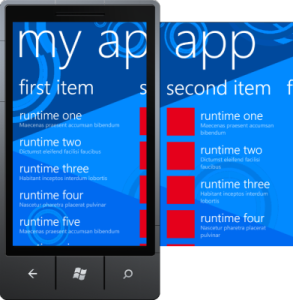 I personally prefer the WP7 UI! Concerning Multimedia my experiences are that the iPhone makes better photos, while the Omnia 7 with Windows Phone 7 has a better interface for taking and viewing photos. Furthermore I compared the sound of both devices and in my subjective opinion the Omnia 7 wins. With the same in-ear headphones the Omnia 7 produces clearer sounds with finer levels and a convincing bass. Meanwhile I prefer hearing music from my Omnia 7 instead of my iPhone. Moreover the integrated phone speakers of the Omnia 7 are much better than the silent iPhone speakers. To sum up, I didn’t think that as proud iPhone 4 owner I could get a new, fresh and compelling mobile experience. But Windows Phone 7 convinced me of the contrary. It comes with an easy-to-use, intuitive and user-centric interface, which isn’t just another iPhone clone, but which has some interesting characteristics. The hardware of the Omnia 7 is great and in my opinion it’s one of the best (if not the best) WP7 devices out there at the moment.